In a large Ziploc bag combine the potatoes, 2 tablespoons oil, Italian seasoning and garlic pepper & shake to coat. Add potatoes to baking pan and spread out. Roast at 400° for 20 minutes, stirring once. Add asparagus to your used Ziploc bag and toss with remaining oil. Once potatoes have completed first 20 min of baking make room for asparagus stalks, sprinkle all with salt and pepper and roast for 20 minutes longer, stirring occasionally. Depending on your oven you might need adjust baking time to 10 min more or less. Rinse fish and pat dry; place on the baking pan. Season each fillet with salt, cracked pepper, lime zest and lime juice. Add fish to the pan. Place a pat of butter on each fillet and cook in the oven for last ten to 12 minutes of your potatoes & asparagus cooking time. Both recipes yield 4 servings. A nice touch is to sprinkle parmesan cheese on potatoes & asparagus. 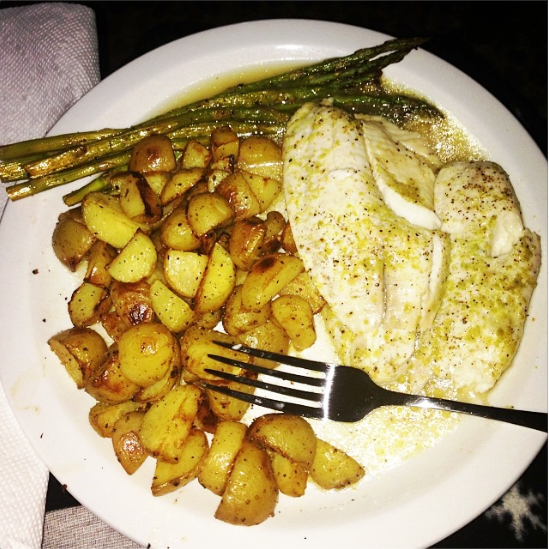 Recipe sources: Tilapia modified from Bobby's baked tilapia & side dish is result of trial and error of many a recipe.